On weekends when I am at home and not busy, I have started going bowling after breakfast at the Wigwam Restaurant. (They have half-price bowling from 9 to Noon on Sundays.) Today, for a change, Lisa came along with me, not to play, but to watch, and that of course meant that Kuma Bear came along as well. 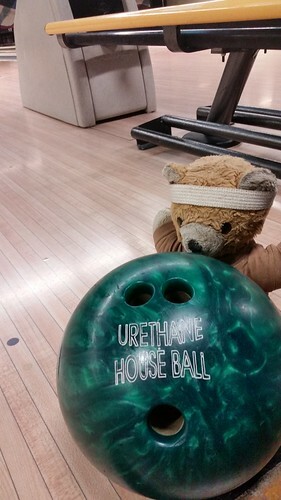 Kuma always likes to get involved, but complained that the ball weighs more than he does! He had to retire to the couch and superintend instead. I managed to get just over 300 pins over three games, which is okay, but below what I had been doing. I continue to toy with the idea of buying my own ball and shoes if I'm going to do this regularly. However, I'm going to be busy for the next couple of weekends (not least of which is Westercon! ), and much of the rest of summer with Worldcon 76 looming, so I may not get back into the swing of things until September.